he harmonic blocks concept began to be developed four or five years ago; it is something on which I’ve been working leading up to the recording of 17/66. To explain it very briefly: it involves opposing or contrapuntal two-handed chordal tapping on the 30-string or 36-string. For example on the 36, I can tap 8-voice chords in each hand; hence 16-voice chords are achievable. These are harmonically dense structures, and I do not hear them as, or think of their theoretical functioning or theoretical analysis as chords. Due to their densities and complexities, I hear them as what I term harmonic blocks. 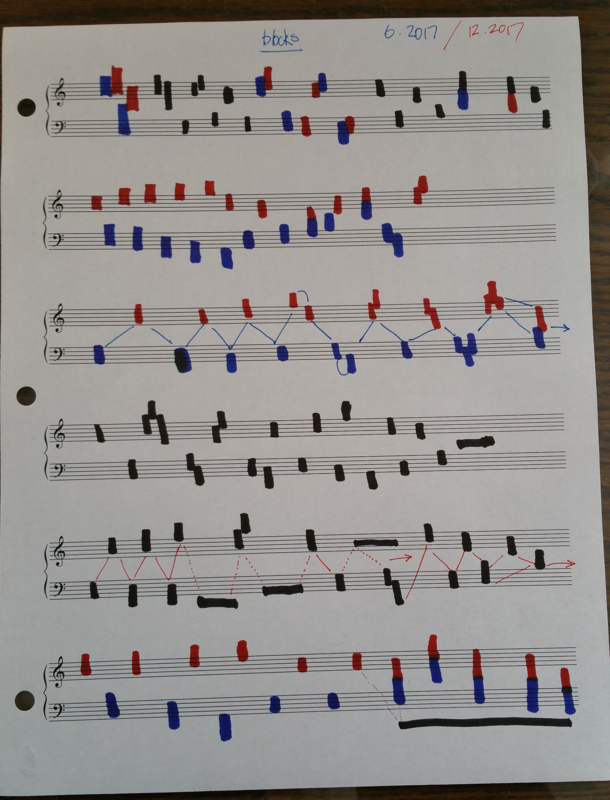 I can use these in a contrapuntal structure and setting such that these two sets of 8-voice chords (or sometimes 6-voice chords) are used as and functioning as polytonal lines, instead of using single-note monophonic lines to function as polytonal lines. It could arguably be defined as a new species of counterpoint. 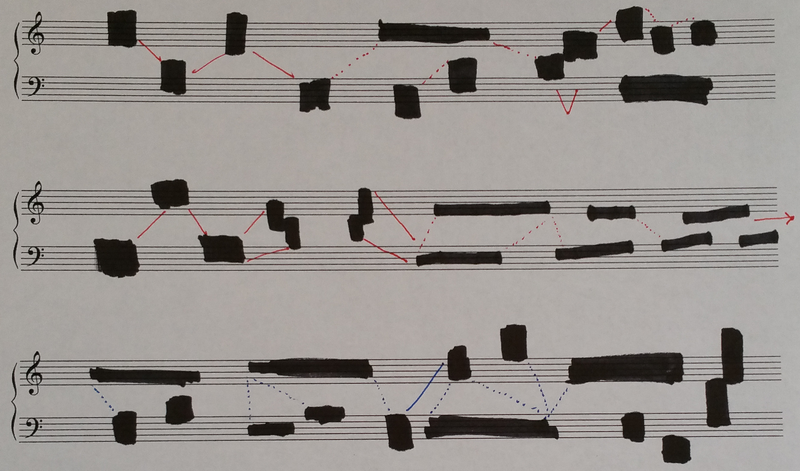 In this manner, chords, or in my case, harmonic blocks, become actual counterpoint itself. This is instead of or literally replacing separate monophonically-based linear counterpoint. This theory is evident and employed on most of the album, but is most present in the final track 15.5mH. 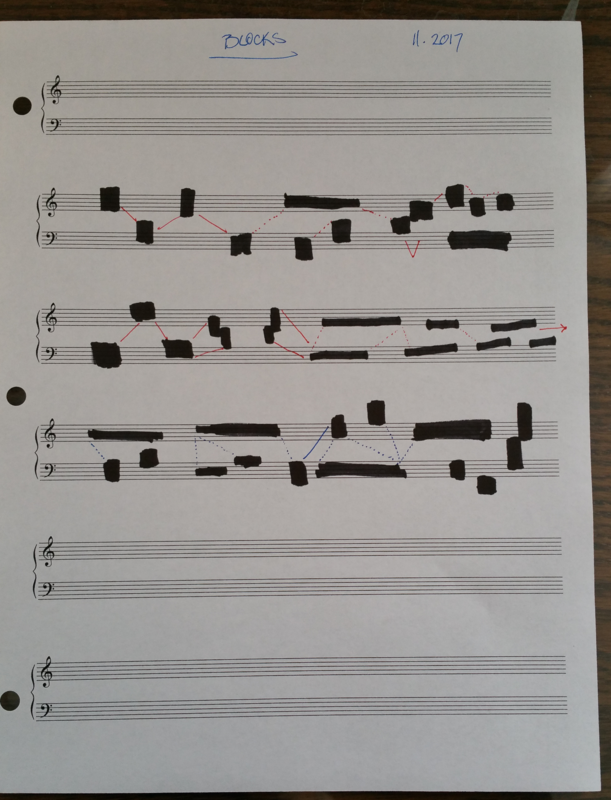 As I was figuring out the harmonic blocks concept, I created some drawings to represent it, along with sketching some examples on manuscript score paper. The drawings were helpful in enabling me to physically and visually grasp some of these concepts; to be able to see it instead of only hearing it. I have a deep interest in architecture; I read about it extensively. I had been doing some research on Brutalist architecture. I knew nothing about it, so I was reading about it so as to better understand it. I’m not that enthralled by most of the Brutalism designs, but some of the underlying concepts are interesting to me. This was happening about a year before the recording dates for the 17/66 project. As I was reading about Brutalism, I found the Wotruba Cathedral in Vienna. This cathedral is for me the most beautiful example of Brutalist architecture. When I found it, it just stopped me dead in my tracks, as the Wotruba was very similar to the drawings I had of the harmonic blocks concept. It looked like what I had been hearing for the past few years. Finding this physical manifestation of what I was hearing and on which I was working was not just a coincidence; I believe the timing happened divinely. During the recording sessions, I had a few photos of the Wotruba around the studio. It was helpful to me. The pieces on 17/66 are not based on or inspired by the Wotruba Cathedral, but there is an absolute connection there.